Today is nostalgia day! These are my first ever nail polish swatches - and as you can see they're the lousiest possible swatches anyone could make. They're made on a paper towel, and these were a bunch of swatches made at the Nails Inc store, and I made them on a piece of tissue paper because that was all I had to swatch on, and I couldn't do it on my own nails because they were painted with something else at that point in time. LOL! I can't believe I started out making swatches like these, because they really are quite craptastic! I just posted them here for a laugh more than anything else, so I hope they've entertained you! Aww, we all gotta start somewhere though right? :D Plus they're still helpful! i've never done a swatch so this is still helpful for me. i like that hanover square! This is adorable! It made me smile. 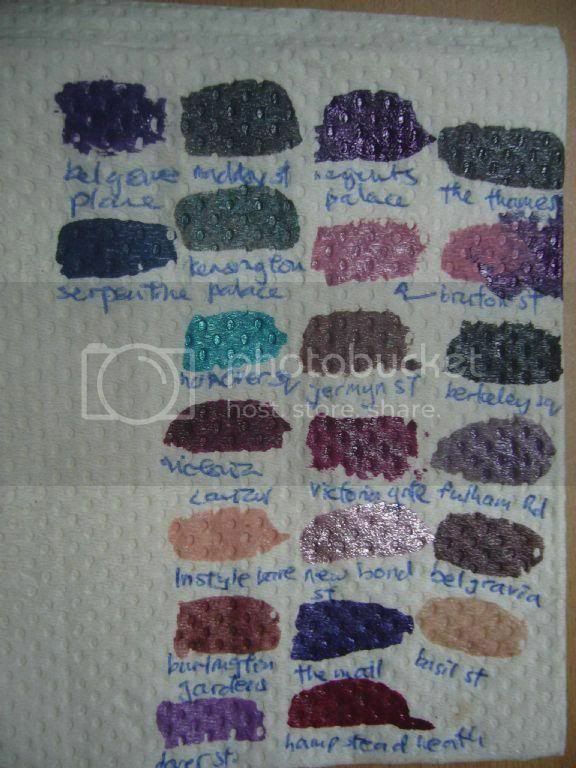 It reminds me of when a pen friend and I would send nail polish swatches done on paper to each other. I like it! I've swatched on paper in a shop before. Hey Lady...I tagged you with an award. Go pick it up at my blog and keep the fabulous posts coming! this is funny! i love that you posted this piece of your past! WOW!THIS BLOG IS SO PERFECT! !GOOD WORK! Nice to reminisce :) I love your Nails Inc collection though! Pining over some of those shades myself. I've got a Nails Inc obsession and it's so hard to get them from where I am!